Breakfast when you’re camping should be as fast, easy, and flavorful as possible. It also helps if it’s low on work for clean up duty. Your campers will wake up hungry and cooking at the campground can be slightly different from cooking at home. We found a few recipes you might like to try and we think a few of them will become family favorites. Toad in a Hole – You can make this up in advance the day before you’re planning to eat it. Store it in an air-tight container and you’ll be all set when you’re ready to begin cooking. You’ll need a cast iron pan to cook it all in. Add together some cornmeal, flour, sugar, baking powder, milk, eggs, butter, and sausage links. It’s kind of a one-pot pancake and sausage meal that everyone loves. Drizzle it with maple syrup when you’re ready to eat. Campfire Breakfast Burritos – This is the best way to get your breakfast when you’re camping. It’s easy to customize per person and can be wrapped in parchment paper – no plates required. You can make them with scrambled eggs, bacon, sausage, hash browns, red and green pepper, jalapeno, salsa, shredded cheese, or any combination of these that you love most. 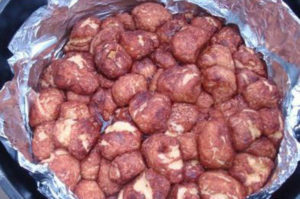 Campfire Monkey Bread – This one is easy and you may find you need to make extra because they are going to go fast. You can make it in a dutch oven or a pie iron. It’s simple when you use pre-made biscuit dough, sugar, brown sugar, cinnamon, butter. You’ll be cutting the biscuits into pieces and dropping them into the cinnamon and sugar mixture. Then cook them over the campfire coals and dig in! You can find the instructions for these recipes and more at 11 Quick and Easy Campfire Breakfast Recipes. We hope you’ve found a few recipes to make your breakfasts fabulous and start everyone’s day off on the right foot.